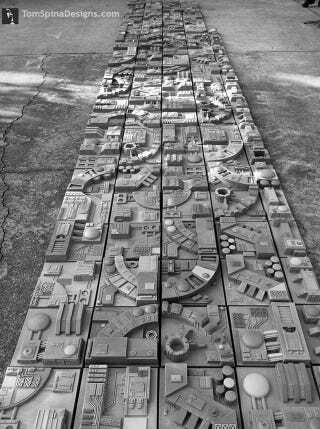 Turn any surface of your home into the cavernous surface of the Death Star thanks to these custom-made Star Wars tiles. What a brilliant idea! Designed by Victor Brown and Tom Spina Designs, these 14 various tiles can be rearranged in any number of ways. Imagine holding a small child over this like an X-Wing and re-enacting the trench scene. That sounds like a perfect childhood to me. For more information head over to Tom Spina Designs, but also take a look at this custom-made Star Wars theater the tiles were added to. Fantastic. Really fantastic.